I took a class this week on “Soil Health and Drought-Resilience for 21st Century Farms” at Ploughshare. I took that quote away From Day 1 of the three day class,. Owen Hanblutzel, the instructor, gave the example of US Agriculture that focuses on getting rid of weeds – and now we have weeds that are more resistant to herbicides. So by managing for “no” weeds, we produced stronger weeds. If instead we managed for healthy soil, weeds will take care of themselves. We saw this in the garden this year. We basically ignored all weeds – except for the arch enemy, the devil of all weeds – bermuda. 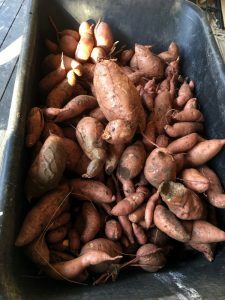 And while we had some weeds, when they got to be in the way, I fed them to the cows, and we’ve had a very bountiful harvest. I see the same effect when we manage for poultry disease versus managing for poultry health. When we manage against disease, we think in terms of minimum square feet per bird, vaccines and antibiotics. On the other hand, when we manage for health, we look at ways to diversify their feed, add probiotics, clean water, manure management, shelter, roosts, minerals, and the like. 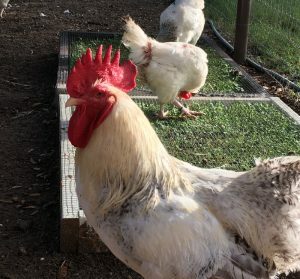 In this healthy environment, most disease stays away – there is still some – like Mareks – similar to bermuda in the plant world that still shows up, but mostly the chickens are healthy. The Delawares are a funny group. They have the largest outside area, but they like to stay in the shade of the live oak trees. In the early morning, they can be found in the grass – but come 10:00 am – they are back in the bare dirt shade. I wanted to try giving them something green to eat in the shade, but they destroy everything I’ve planted there. I had a couple of partial chicken runs that were about 2 ft square. I took a piece of that apparatus that ended up as a 2×4 frame with hardware cloth on it. A week ago, grandson, Robert and granddaughter Ruth and I put an inch of compost on the ground, put the chicken seed mix on it and watered it in. I watered it twice a day – and in 5 days it was growing good. 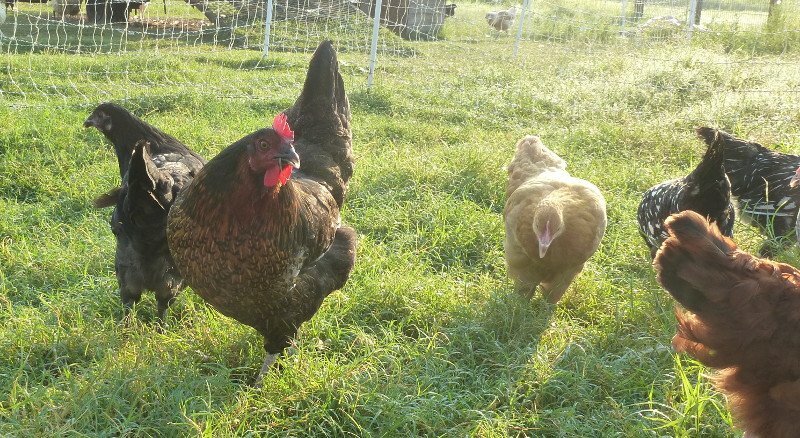 Now the clover is poking through the hardware cloth and the chickens are eating the tops, but they can’t get to the ground to scratch it all up. At this very moment we have around 15 gallons of milk in the fridge, and I’m about to go milk. We’ve taking to letting the oldest milk clabber – just set it out on the counter, and in a few days it looks like a stiff pudding. Wait a few more days and the water separates and you have chunks of clabbered milk. The chickens love it. I’ve been sprinkling a multi-min mineral mix that I use for the cows over it and giving it to them. We took the milk that Caleb baptized – full immersion – not sprinkled – the kitten in and clabbered it – the birds rejoiced in his act.